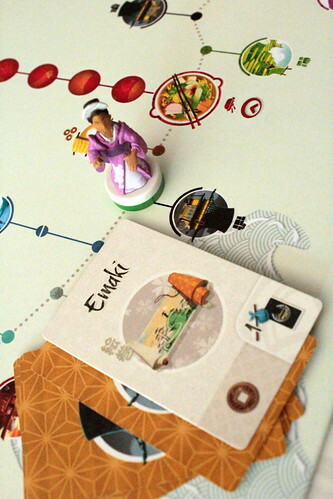 The Tokaido, Japanese for East Sea Road, was the most important road in Edo period Japan. It connected Edo with Kyoto along the coast of Honshu, so it was not only an important transport route but beautiful as well, treasured by travelers for its views and cultural experiences along the way. Those experiences are what players are after in Antoine Bauza’s game Tokaido. It’s not about arriving first, it’s about having the richest experience along the way – which is how all tourism should be done, but I digress. Players have all the liberty they could want in traveling. The next turn always goes to the player who is furthest behind on the road, and he may choose any free space to move to. The only rules are that you may only ever move forward, and you may not pass an inn, stopping there is mandatory until all players have arrived. Of course things are never as easy as they sound. Each location along the road where a player might stop has only one space, some have two when you’re playing with four or more players. If there is no space, you cannot stop there, and once you go past you can never come back. You score points by collecting sets of cards from those locations, so missing one that you needed is really painful. Deciding if you should skip some good spaces to guarantee a great one or take an extra stop and risk not getting that space you really wanted is what drives the game. Once you decided where to stop, taking the action for that space is always quick and simple, but may still force you to make tough decisions. Stop at a Shop, for instance, and you may buy souvenirs. From a random selection of four cards you may buy as many as you want and your traveling purse can afford. Souvenirs come in four types – small objects, art, clothing and culinary – and go in sets with one card of each type, worth quite a lot of points if you get all four. Where does money come from? Why, I’m glad you asked. You have a small starting fortune depending on the character you picked, with less money the more powerful his or her special ability is, and you can stop at a Farm along the way to take three coins – that’s one stop where you don’t make decisions. Furthermore there are three types of Panoramas, beautiful views where you stop to paint. The Rice Paddy, Mountain and Sea panoramas have three, four and five cards, respectively, and each card you add is worth more points than the one before – but if you miss a good spot to paint, you might never complete your painting. Hot Springs are simpler again. You stop there and draw a card worth two or three points. At a Temple you may stop to donate money, buying one point for each coin with extra points to the most generous giver. And you may have Encounters along the road and meet other travelers willing to give you a random benefit, copying the effect of one of the other spaces. Finally, we have the Inns. As mentioned above, they are the only places where all players have to stop. Here they can have a meal if they can pay for it, and pay extra coins for the culinary experience. 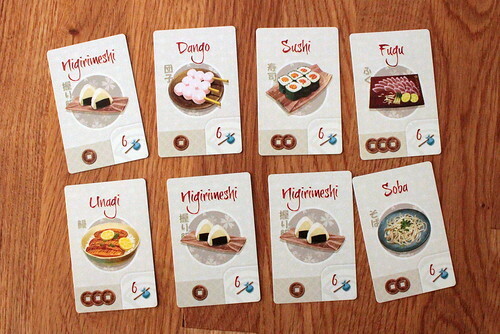 The meal cards are the most evil part of Tokaido when playing on an empty stomach, the food looks delicious. Arriving at an Inn before the other players lets you choose your food first and lets you pick cheaper food that’s still worth the same points, or the expensive food if you’re going for the bonus points for spending the most on yummies. But due to how turn order works, the last player to arrive will leave the Inn first. The decision when to go to the Inn is tactically interesting this way, and it prevents players from just charging ahead for the whole game. The base game as presented here is a medium-heavy game at best, maybe even a bit on the light side. The rules are easy to grasp for everyone, but already there is a lot of strategic and tactical depth. You’ll want to decide early where you want to score the big points, and go for them best as you can, but at the same time you want to pick up extra points wherever the opportunity presents itself. It’s family friendly yet very satisfying. But this is the Collectors’ Edition, so the base game is not all we have. There are two expansions included in the box to mix in as soon as you’re comfortable with them. First, there is Crossroads. This expansion adds an extra decision to every space on the board: you can either take the regular base game action, or a new expansion one. At a Panorama space, you can still paint a piece of the panorama, or you can paint a cherry tree for two points and a coin. Better at first, but it doesn’t get to the higher scores like a panorama painting does. At the Farm you can choose to gamble and make some extra money – or lose some money you had. And there are some harder decisions to make. At the Temple, you may buy an Amulet with a powerful one time effect. And I mean powerful, as in “when you’re move takes you to the first place, you may discard the amulet to move again.” In the same vein, players arriving at a Shop may spend their money on a Legendary Object that are worth extra points in different ways. And instead of encountering another traveler they may buy a calligraphy card that will award points based on other conditions, like remaining money when the game ends or meals you skipped along the way. Wherever you can take a new type of card in Crossroads, you don’t draw that card but pick one of the remaining ones. That lengthens the game, especially the first time you play but also makes Crossroads more strategic – with all the kinds of cards, you really want to pick the ones that fit your overall strategy and your Travelers’ special ability. And then there is Matsuri, a second expansion that can only be used together with Crossroads. Matsuri is the Japanese word for festival, and that’s exactly what the expansion adds to Tokaido. At each Inn the first player to arrive there draws two Matsuri cards and picks one them. It will either have an immediate effect or a continuing one that lasts to the next inn. Many of the festivals add a beneficial effect somewhere, like Hadaka Matsuri that lets you have an Encounter when you stop at a Hot Spring. Two things at one stop, that’s great, even if the traveler is naked in the hot water. But you also get things like Toka Ebisu, where all Shops until the next Inn close one space, even if that is their only one. If you’re playing for souvenirs, that can really mess up your day. 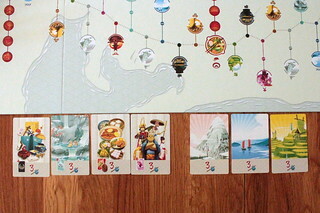 Matsuri adds some randomness to Tokaido, an inconvenient festival can break your strategy. On the other hand, that gives you a greater incentive to arrive at the Inn first: at least you get to choose the lesser evil then. Be it base game, Crossroads or Crossroads and Matsuri, Tokaido is always a great game. It’s quick to learn, has very little downtime even with the card choices in Crossroads, and it’s just full of decisions. And all of them affect the outcome, too. You never have decisions that don’t matter in the end. There is no direct interaction, but space on the tokaido is so limited that you always get in each others’ feet. Predicting where others will want to go and block them/not be blocked by them is definitely part of the game, but it’s very hard to lock someone out completely – they may just have to skip a lot of spaces to guarantee they get the next spot they need. What I’m trying to say is, you can annoy people, but not to the point of making them punch you. And then there’s one more thing about Tokaido. From the first time I saw the game, I’ve been calling it one of the prettiest boardgames ever. I regret that now, because it doesn’t leave me anything to describe the Collectors’ Edition. 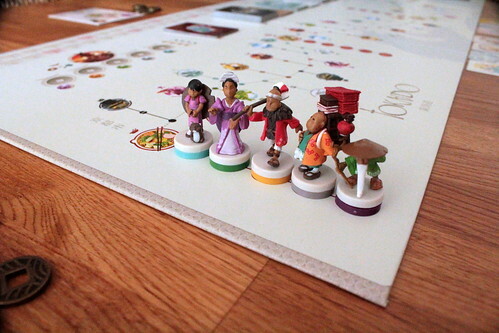 It has the beautiful board Tokaido always had, with the tokaido and the very colorful locations on the gray and white board that look unique and amazing. And it has the cards in a matching design, beautiful travelers and souvenirs and utterly mouthwatering food. Naïade, Tokaido‘s artist, has really created a masterpiece. But on top of that, the Collectors’ Edition has 39 beautifully detailed plastic miniatures for the traveler characters. At the level of the Kickstarter I backed, they even came pre-painted – and I was never so happy to splurge extra on a pure luxury add-on. In a city where the law is nothing but letters in a book, where not only city hall but even the police itself are under the control of rivaling gangs, in a city where everyone with a bit of importance is wearing a fedora – that’s where you play Mafia City. 7 Wonders is still one of the most popular games out there. Simple rules, quick to play even with 7 players, different every time you play. It’s no wonder the expansions keep coming. They might not necessarily improve the game, just because it’s very good already, but they add enough to keep 7 Wonders interesting even after many, many games played. Babel is the latest expansion, and the one that changes the game the most yet. A very unique card game in more than one way. You’re not only holding your cards the wrong way around, you’ll also be thinking about how you communicate in completely new ways. That’s not bad for a game that only takes 25 cards in the right order to win.